We’ve given the Buca family of restaurants a lot of love for their top-notch food, but the décor is also worth a mention. The industrial-chic design at Bar Buca manages to be minimalistic without being cold, and the sky-high ceilings let in streams of natural light. 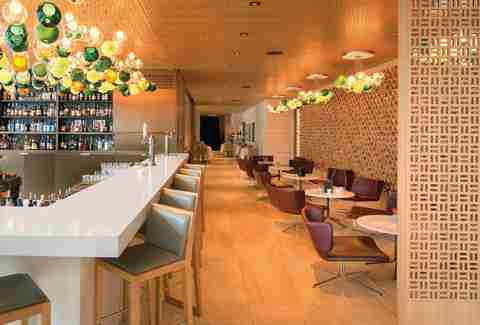 Sleek white marble bar tops further brighten up the all-day, European-style snack bar. Stop by in the morning for an espresso and pastry, and swing by after work or into the evening to sample something from the small-plate-focused menu. 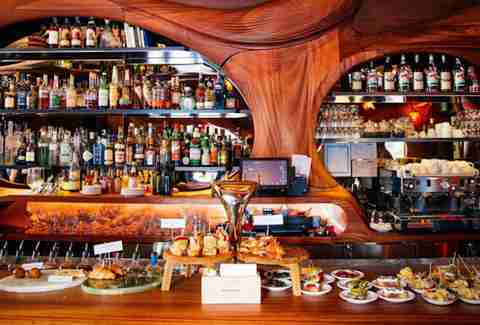 Upon walking into Bar Raval you might feel as though you’ve taken a fantastically wrong turn and somehow ended up in the middle of Barcelona. You haven’t, but this is as close as you’re going to get without booking a plane ticket. Chef Grant van Gameren’s much-loved space has a beautifully surreal Gaudi-esque design, all swooping curves and dark mahogany, looking at times more like an art piece than a bar. 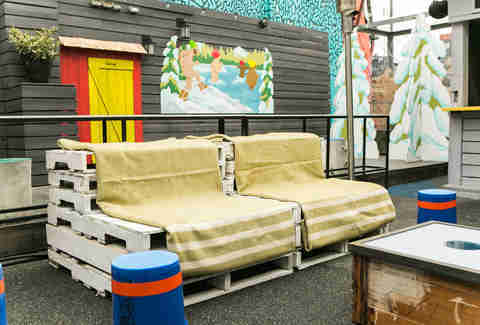 The Sky Yard at the Drake Hotel literally sets the bar a little higher with a rooftop patio open year-round. While the theme and decor change with the season, it’s always welcoming, vibrant, and often whimsical, and the colourful space will be buzzing with happy patrons sipping seasonally themed cocktails. In the winter, order your drink and make a beeline for a choice seat by the fire pit. This members-only cocktail club is worth the $25 monthly price of admission for access to some seriously delicious cocktails, many of which are made from recipes dating back more than 100 years. 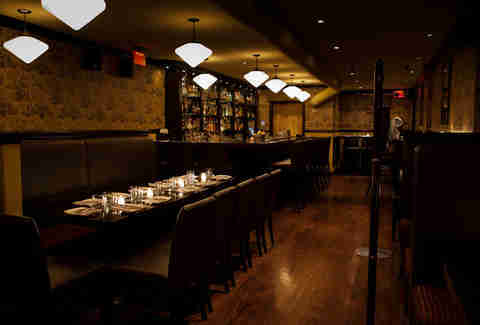 The upscale speakeasy vibe and sophisticated décor are perfectly conducive to lingering over a handcrafted drink made with booze from one of the city’s most impressive liquor collections. 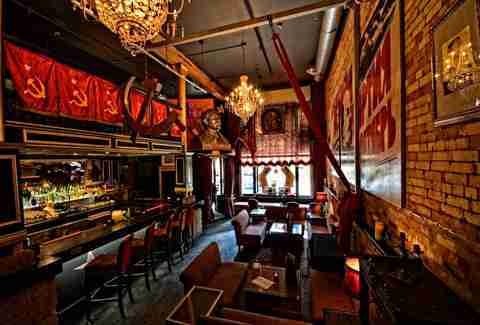 Opulence is what you’ll find at Pravda. Well, that and vodka of course. The sumptuous, rich red décor makes you feel a bit like you’ve wandered onto a movie set, along with similarly sharp-looking extras sitting around drinking cocktails. If you’re in the mood to imbibe (and of course you are) Pravda’s cellar is home to 70 of the world’s best vodkas. Since anything Grant van Gameren touches turns into a place with a lineup and/or waiting list for reservations, it’s no surprise that he has two spots on this list. 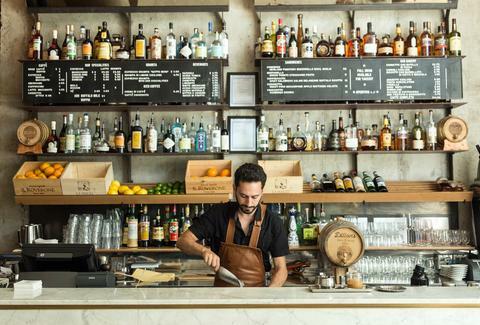 Like Bar Raval, this place has a focus on Spanish tapas and killer cocktails. 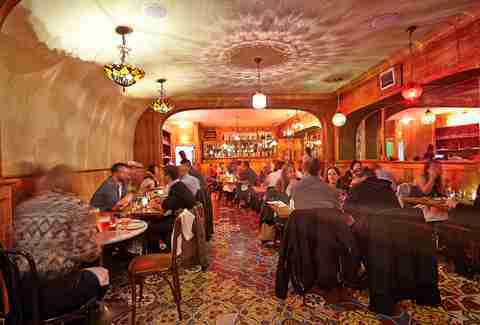 The decor is inspired by van Gameren’s travels through France, Italy, and Spain and features a curved ceiling, an eye-catching encaustic-tiled floor, and a long cherrywood bar for enjoying those aforementioned drinks. The first thing you notice upon walking up to The Bar at the plush Shangri-La Hotel are the green and white glass orbs suspended from the ceiling like miniature balloons released for a celebration. The effect is striking without being distracting, and is balanced perfectly by the neutral palette used throughout. In addition to a well-curated wine list, the bar menu here focuses on classic cocktails from the 1930s. 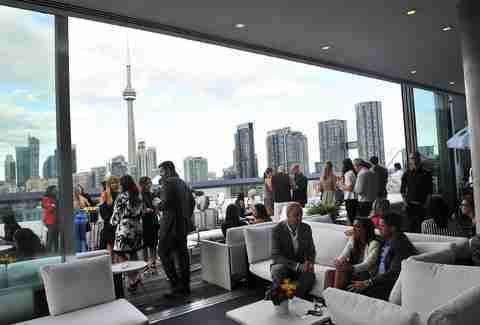 The second roof lounge on our list can be found at the swank Thompson Hotel. In the summer it’s one of the most sought-after addresses in town thanks to the gorgeous infinity pool, but guests have access year-round. Not only do you get to soak up the sumptuous atmosphere reminiscent of a breezy Miami Beach house, but you get 360° views of the Toronto skyline and Lake Ontario while you drink. Jessica Padykula is a Toronto writer who hopes that the bars not on this list don’t develop low self-esteem or anything. Follow her at @JessicaPadykula. This inviting British pub in the heart of Yorkville trades stuffy for light and sophisticated in terms of décor and atmosphere, beginning with the vibrant red exterior. 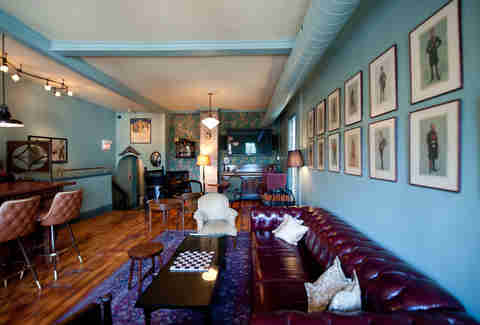 Inside you’re greeted with caramel-coloured banquettes which coordinate perfectly with mint-green walls. A fireplace keeps guests cozy when temperatures drop.